Our first game of the year was against Griffith Barracks and a very entertaining match ended with the sides even. Hello I’m Adam from sixth class and I play on the school Gaelic team . 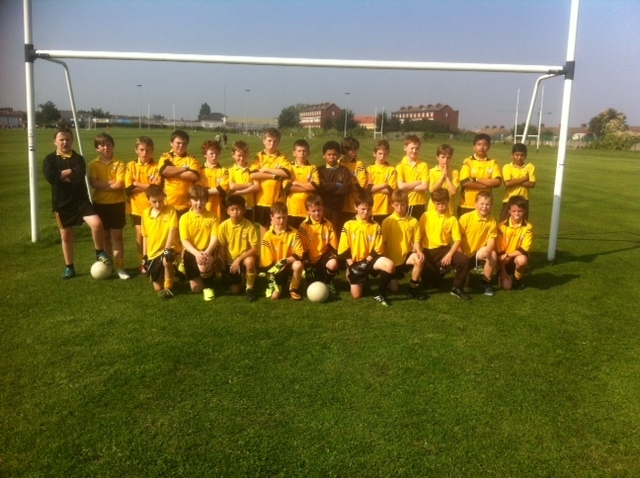 Last Thursday we had our first Gaelic match against Griffin Barracks School. We played in Dolphin Park, during the first half Griffin Barracks scored the first point. The have boys and girls on their team. They played really well in the first half but we scored a goal. The second half was very close we ran up and down the pitch everybody played well. The final scored was 18-18. Jude from fifth class scored one of our goals and Cathal from sixth scored a few of our points. Our first match of the season was against Griffin Barracks in Dolphin Park. We got off to a shaky start and because of that we were down by five points at half time. We improved immensely and pulled it back to a draw just before full time. It ended up eighteen all, but I thought we deserved to win. The parents on the side line said it was a pleasure to watch. Unfortunately it ended up as a draw.